Book your earlybird rate before 30 October. 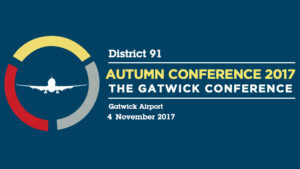 Full Ticket £109.00 (+ booking fee) – ticket includes celebratory dinner and the daytime conference ticket. Full Ticket £119.00 (+ booking fee) – ticket includes celebratory dinner and the daytime conference ticket. Book your conference tickets here. District officers, please not the District Executive Committee (DEC) Meeting will take place on the Friday evening, and attendance is free of charge. Double/twin deluxe room – £94.00 bed and breakfast single or £104.00 bed and breakfast double occupancy. Please note the Conference Program may be subject to change due to circumstances beyond the control of the organisers. The District 91 Humorous Speech Contest and Table Topics Contest will take place on Saturday 4 November 2017 at the Hilton in Gatwick. This will be preceded by Area contests in September and Division contests in October; to qualify first enter your club contest. For the Humorous Speech Contest the contestants present a 5 to 7 minute humorous speech that must be thematic in nature (with an opening, body and close) and not a monologue i.e. series of one-liners. For the Table Topics Contest the contestants present a 1 to 2 minute impromptu speech. All contestants are assigned the same topic, which is told to them when they are introduced by the contest chair. See our calendar for a list of the divisional contests and check the website for previous district Humorous Speech and Table Topic winners. Please do you have an agenda for the day. It will be emailed shortly. Is there a separate or different fee for contestants? Yes, please contact Filip Balota, the conference organiser. Is there an agenda for the day, and if so, where is it??? We are working on it. Dilys has been emailed.